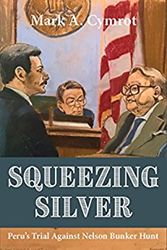 Twelve Tables Press today announced its newest publication, Squeezing Silver, Peru's Trial Against Nelson Bunker Hunt, written by Attorney for the Plaintiff, Mark A. Cymrot. The legal thriller is now available for purchase in print, digital, and audio at http://www.twelvetablespress.com and on Amazon. In Squeezing Silver, Cymrot depicts the legal strategy, an intense and remarkable courtroom battle that he experienced as a key member of the team that took on titans in business and government. The author takes the reader inside the courtroom and behind the scene of one of the most important trials in recent decades. He describes how famed Texas oil billionaire, Nelson Bunker Hunt, and Saudi royalty manipulated silver prices over four months in 1979-1980 while meeting at thoroughbred horse events, five-star hotels and posh restaurants. When silver prices spiked, they pocketed billions while thousands were cheated, including Minpeco, Peru's minerals agent. Regulators conflicted by their dealings with Bunker failed to stop his, “broad daylight conspiracy.” When prices crashed two months later, the Hunt defaults threatened the US economy with collapse. Paul Volcker, Federal Reserve Chairman, engineered the first controversial too-big-to-fail bailout to save the U.S. economy. This memoir is a must-read for attorneys and non-attorneys alike. For those who enjoy a good legal thriller, it provides the twist, turns and insights not found in most legal stories. For those interested in business and the markets, the book recounts the bizarre events and regulatory failures that were the prequel for the 2008 Great Recession. "A fascinating view inside what was perhaps our first modern financial meltdown,” noted Simon H. Johnson, Chief Economist, International Monetary Fund (2007-08), Ronald A. Kurtz Professor of Entrepreneurship at the MIT Sloan School of Management. “Mark Cymrot's meticulous account reads like a legal thriller complete with larger than life characters, secret liaisons, and all the machinations we have come to expect from powerful defendants. In the end, there was justice, of a particular yet meaningful American sort. Could this still happen today?" The author, who is ranked in Chambers Global and The Best Lawyers in America©, began his legal career in 1973 and was admitted to practice before the U.S. Supreme Court in 1977. Cymrot is a Partner at BakerHostetler LLP and leads the law firm’s International Arbitration and Litigation practice team. Cymrot has authored more than 30 publications and a frequent speaker on topics drawn from his career in high-stakes US lawsuits and international arbitration. For review copy or to schedule an author interview, contact steven.errick(at)twelvetablespress(dot)com. About the Author: Mark A. Cymrot is the Leader of Baker Hostetler LLP’s international arbitration and litigation practice. He was the lead lawyer in the trial that led to Squeezing Silver, Minpeco SA v. Nelson Bunker Hunt, which was tried for six months in New York federal court in 1988. He is an author of more than 30 book chapters and articles and frequent speaker on topics drawn from his illustrious career as counsel in US lawsuits and international arbitration and as an arbitrator. He has defended the International Monetary Fund, World Bank, and the High Representative of Bosnia and Herzegovina on immunities issues. He was special litigation counsel in the Civil Division of the Justice Department. He is ranked in Chambers Global and The Best Lawyers in America© (International Arbitration – Commercial and Governmental) and is listed in Who's Who in America. About Twelve Tables Press: Twelve Tables Press is a legal trade press featuring leading attorneys and their individual impact on the legal community. Twelve Tables Press is co-owned by Steve Errick, a legal industry publisher and Chief Operation Officer of Fastcase, Larry Selby, a former American Law Media (ALM) Vice President of Research Solutions, and Jay Tidmarsh, a Professor of Law at Notre Dame Law School.